Sometime last week I made this Chinese Five-Spice Roasted Chicken and I finally had a chance to add it to the blog just in time for your weekend meal prep. It’s a pretty straightforward dish: combine things...let those things marinate...roast those things...enjoy. I’ve always had Brussels sprouts cooked. Specifically, I usually do a simple braising of Brussels Sprouts. However, this recipe was my first venture into raw Brussels sprouts and I am so happy that I tried them this way. Here's another way to make use of your leftover turkey. Or you can just use chicken. Again, I used my homemade turkey stock to add some additional flavor to these stuffed mushrooms. Although I used quinoa, feel free to try this recipe using another grain like rice or farro. When was the last time you had a slice of good lasagna? I love lasagna but I’ve actually never made it....until now! Yesterday, during my free time I started poking around the Internet for lasagna inspiration and trying to find ways to make my lasagna a bit healthier without sacrificing the rich flavor. As Summer 2018 began to wind down, I realized that I hadn’t grilled anything! Not a burger! Not a bell pepper! Not even a hot dog! So, naturally, I freaked out and started brainstorming what I could throw onto a small grill. This recipe was born out of a desire to hone my fish filleting skills; I have a lot of progress to make. Haha! I decided to use red snapper because while working on the sesame crusted tuna recipe, I learned that snapper is one of the safer fish when it comes to mercury contamination. Check out the infographic below. Red snapper is an excellent source of protein and is low in saturated fat. 4 ounces of red snapper gives you 113 Calories, with the majority of those calories coming from the 23 grams of protein. Let’s cook! Try this recipe and let me know what you think. In a medium bowl, combine all the ingredients for the mango salsa. Season with salt and pepper to taste. Note: If you’ll be keeping the skin on your fish, refrigerate the fillets (skin up) uncovered for about hour to dry the skin. 1. If you are cooking the fillets with skin on, lightly score skin with a sharp knife. 2. Season both sides of fillets with curry powder, chipotle powder, salt and black pepper. 3. In a large non-stick skillet, heat oil over medium-high heat. Add thyme and garlic; cook until garlic is medium to dark brown. 4. Add fillets (skin side down first) to skillet; use a spoon or spatula to press filet for about 15-30 seconds to prevent it from curling. Cook for about 2 to 3 minutes per side until cooked through and golden brown. You may have to do this step in batches depending on the size of your skillet and fillets. 5. Remove fillets from skillet; serve warm with mango salsa. How do you decide what type of tuna to buy? There are several types of commercial tuna. The most popular ones are Albacore, Bigeye, Bluefin, Bonito, Skipjack, Tongol and Yellowfin. Depending on where you live, some of these may be more popular than others. Each type of tuna is an excellent source of protein: a 3-ounce serving of tuna provides around 20 grams of protein. Tuna is also rich in omega-3 fatty acids with Bigeye, Northern Bluefin and Southern Bluefin tuna having the most fat. The higher fat content gives them a creamier texture and makes them favorable choices for raw tuna dishes like poke and sashimi. So, yes tuna is an excellent source of protein and omega-3, but what about food safety? Some types of tuna and other large fish like King Mackerel, Swordfish, Shark and Marlin should be avoided because of their extremely high mercury content. Bigeye and Ahi tuna have the highest levels of mercury and should be avoided. Bluefin has been shown to have elevated mercury and PCBs levels in some areas; you should eat this tuna infrequently (no more than 1 serving a month) or never. Albacore and Yellowfin have high levels of mercury and their consumption should be limited to three servings or less per month. Skipjack has moderate levels of mercury; you can get away with six servings or less per month with these. The FDA advises pregnant and nursing women to avoid tuna and that children should eat smaller servings. Check out the FDA and EPA’s data on mercury to learn more. If you’re more of a salmon person then you’re in luck. Salmon (except for farmed or Atlantic salmon) has much less mercury so you can enjoy 4 or more servings a month of it. The takeaway: For most tuna, limit your consumption to a few servings a month. Completely avoid Ahi, Bigeye and Bluefin. Now that we have gotten all the serious stuff out of the way, let’s get to cooking. If you ever come across some high quality, fresh, mercury-safe tuna, try this recipe and let me know what you think. 1. In a bowl, combine soy sauce, rice vinegar, ginger, garlic, brown sugar and black pepper to make a marinade. Place tuna in a ziploc bag and pour in marinade. Let tuna marinate for at least 30 minutes. 2. Remove tuna from marinade and pat dry. Firmly press sesame seeds into tuna steak. 3. Heat a non-stick skillet over medium heat. Spray with cooking spray. Place encrusted tuna steak into skillet and cook until desired doneness. For a 1-inch thick steak, cook for 2 minutes on each side for medium-rare. 4. Let steak rest for about 5 minutes before slicing on the diagonal into 1/4-inch slices. When I decided to make this stuffed bell pepper recipe I had a Mediterranean theme in mind. Mediterranean cuisine is rich in olive oil, whole grains and herbs like parsley, thyme and basil. I could have used brown rice for the stuffing but I wanted to try something different. So I turned to another whole grain that I've never cooked before. What do you know about farro? Orange Chicken is a very popular dish in Chinese restaurants across the United States but it’s not really a dish you will find in Chinese restaurants in China. One journalist, Jennifer 8. Lee, describes Orange Chicken as one of the “Americanized mutations of sweet and sour dishes found in China." I am constantly experimenting with different ways to prepare chicken even though I may not always share the results with you. This dish is the outcome of some recent experimenting. I've been on a curry kick for a few meals now. For one of my recent meal preps I made this salmon curry to go with some sautéed broccoli rabe (aka “rapini”, “broccoli raab”, “rapa”). The curry was great over the brown rice! Here's a quick and tasty way to prepare your salmon. This recipe uses the our MBMK Cajun Seasoning Blend. Packed with flavor and ideal for meal prep, this lemon ginger broiled fish will leave you wanting more. It's gluten-free. Those following the ketogenic and paleo diets can omit the small amount of brown sugar. This Chicken Barley Leek soup will make you feel sooooooo good! The blend of spices, ginger and herbs create a round flavor to compliment the satiating feeling of this hearty soup. Don't wait for a cold night to make it. Are you even ready for this chili? For this keto-friendly version of our turkey chili, we reduced the carbs and upped the flavor and nutrients by adding eggplant and kale. Try this flavorful dish a fresh green salad or vegetables. This recipe is gluten-free and ketogenic. Chicken pelau (/pəˈlaʊ/) is a very popular one-pot dish in Trinidad and Tobago; it's this country's version of a pilaf and is packed with flavor. We're sharing with you our take of this dish where we use brown rice. This flavorful dish makes a complete meal with the addition of a fresh green salad or vegetables. This recipe is gluten-free. Check out this flavor-packed, high-protein, open-face sandwich! At MBMK we believe that eating better doesn’t have to be boring so instead of relying on mayo for moisture and flavor, we use fresh ingredients to create a tasty treat that you can use for any meal even brunch. #brunchgoals. One of the secrets to this sandwich is finding a hearty bread. For this recipe we're using SWEET BABY GRAINS® from eureka!® Organic Bread. We chose this bread because we like organic bread that is bursting with rich flavor and tasty goodness. Now, forget all other tuna melts. Don't be bland! Try this recipe! Tandoori chicken is an Indian dish that involves marinating the chicken in a mixture of yogurt and spices. Traditionally, the marinated chicken is roasted in a cylindrical clay oven called a tandoor. Since we don't have a tandoor at hand, we will be making this spicy dish using our oven and broiler; alternatively, you can also cook this on your grill. This recipe is naturally gluten-free and works great for meal prep. Looking for tips on how to prevent your chicken from getting dry? Check out what MealPrepMondays has to say in their post 3 Reasons Why Your Chicken Is Dry. Popcorn Chicken! Yes, please! Here's a high-protein snack that you and your guests can enjoy at any party; this recipe is also low in fat for those closely monitoring their fat consumption. We've added some jalapenos to give these bites some extra kick. This recipe includes gluten-free alternatives; you can use panko bread crumbs or corn flakes to make the crunchy coat. Looking for other party bites? Try our cumin lemon wings or honey wings. Here's a quick tasty way to prepare chicken breast. We added some jalapeno peppers, red bell peppers and green onions to complement our choice of spices. This recipe is paleo-friendly and gluten-free. Try it with our black beans, carrots and rice dish. This avocado chicken salad is great by itself or as a side at your next picnic or BBQ. You can also try it in a sandwich. To cut down on the calories, without sacrificing the taste, we use fat-free greek yogurt instead of mayo. 100 grams of mayo has 680 calories, compared to 59 calories in fat-free greek yogurt. This recipe is gluten-free. If you'd like to make this dish dairy-free, simply omit the greek yogurt and add a little olive oil. Here is our spin on the classic rustic dish. 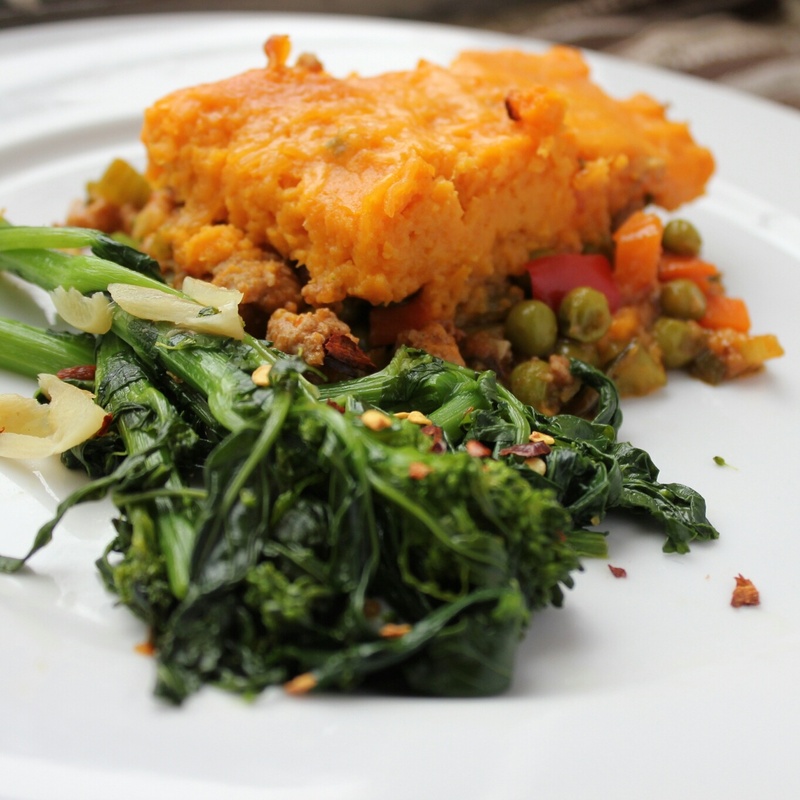 With a smooth, spiced topping sitting on a bed of diced vegetables and meat, this sweet potato turkey shepherd's pie will leave you feeling satisfied. Add a side of greens to this dish and you have a complete meal! This recipe is gluten free and is an excellent choice for meal prep. This dish is basically a complete meal on its own! It's a simple gluten-free recipe with many ingredients! This lean turkey chili is great by itself or with corn bread or rice. This is an easy and very tasty turkey meatballs recipes that sneaks in a serving of spinach. This recipe of gluten free, great for kid meals and meal prep. This baked chicken recipe is pretty simple but is full of flavor. This recipe is gluten free and works great for meal prep. Here's an easy ground turkey dish that takes less than 30 minutes! This recipe is gluten free and paleo. Quick, easy and a bit sticky! These wings are great as a snack for any party and will easily impress your guests. Pair it with our spicy pineapple chow. These wings pack a punch! Inspired by Trinidadian cuisine, these wings are a great alternative to the fried or breaded wings you find at a restaurant or the freezer aisle at your supermarket. This recipe is gluten free! This recipe is one of our favorites here at MBMK. A yummy, creole dish made with brown rice, ground turkey, spices and vegetables. Great way to add vegetables to kids' meals. Enjoy it by itself or with any of our vegetable recipes. This dish is gluten free. You have to try this meatloaf! That's all we're going to say. It's excellent for meal prep and is gluten free! Try it with any of our vegetable dishes, but it is especially yummy with the Creamed Cauliflower.